Democratic gubernatorial nominee Ned Lamont. Knowing a huge budget deficit is just over the horizon, Lamont has been reluctant to pledge full support for all of labor’s priorities, as was Gov. Dannel P. Malloy in his 2010 and 2014 campaigns. And like the governor, Lamont is counting on labor’s sense of self-preservation to kick in and help him defeat a conservative Republican in November. But will Lamont’s broader promises of collaboration with labor and tax fairness be acceptable to unions that want a reprieve from concessions requests and are lobbying instead for higher tax rates on wealthy households and big corporations? Connecticut’s next governor takes office on Jan. 9 facing a projected shortfall of $2 billion in the first fiscal year after the election. That’s a gap of nearly 10 percent in an annual budget of $20.8 billion. There is expected to be $1.1 billion in the emergency reserves, but the reserves can’t be used to mitigate the first-year crisis without causing problems a year later, when the projected budget gap gets worse, by another $600 million. But perhaps the biggest handicap Malloy’s successor faces is that layoffs in any substantial amount are prohibited for the first two years of the next term by a 2017 concessions deal. That means neither Lamont, GOP nominee Bob Stefanowski, nor independent Oz Griebel, will have much leverage to coax further givebacks from unions to close that $2 billion hole. Lamont doesn’t like the word “concessions” and instead has emphasized he’ll ask unions to meet with him to discuss “reforms” to contractually guaranteed benefits. Together, he says, his administration and labor could identify efficiencies that would save the state money and prove acceptable to both sides. But would Lamont rule out seeking “reforms” that would curtail health or retirement benefits? And would he pledge not to seek wage freezes like those granted by unions during negotiations with Republican Gov. M. Jodi Rell in 2009 and Malloy in 2011 and 2017? “I don’t want to rule anything in or out,” Lamont said. “But I’m going to sit down at the negotiating table.” Lamont hastened to add that he respects collective bargaining and would treat labor as a partner. 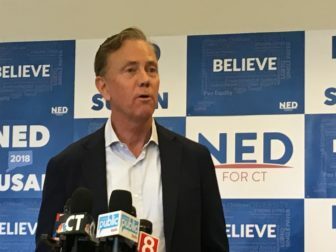 Like Malloy, Lamont has received the endorsement of the Connecticut AFL-CIO, the state’s largest labor coalition. Malloy’s Republican opponent in 2010 and 2014, Tom Foley, only called for concessions in 2010, but Stefanowski has said he wouldn’t hesitate to go to court to challenge state employees’ health and retirement benefits contract if he fears that surging pension and retiree health care costs will sink the state budget. Lamont hopes that distinction isn’t lost on labor leaders. Malloy and other Democrats have joined Republicans for the past two years in rejecting labor’s request for higher tax rates on the wealthy and on major corporations, while still seeking givebacks from the unions. And while Malloy decried Walker’s approach in a once-union friendly state, he dramatically reduced the executive branch workforce, dropping it nearly 10 percent. He also obtained union concessions twice and got labor’s permission last year to defer billions of dollars in pension contributions until after 2032 — helping the state smooth out spiking costs over the next 10 to 15 years. 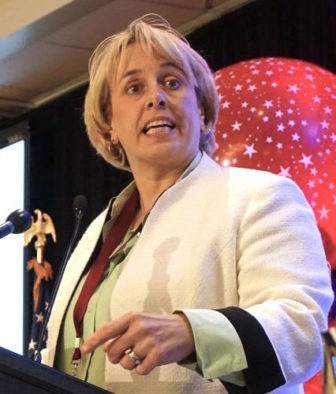 “The candidates for governor need to recognize that it’s time for better choices, not more of the same over-reliance on working people to pick up the slack,” Jan Hochadel, president of AFT Connecticut, said earlier this month. “When the person cleaning an office spends a higher percentage of her income on taxes than the person running the office, that’s a problem,” Pelletier said.